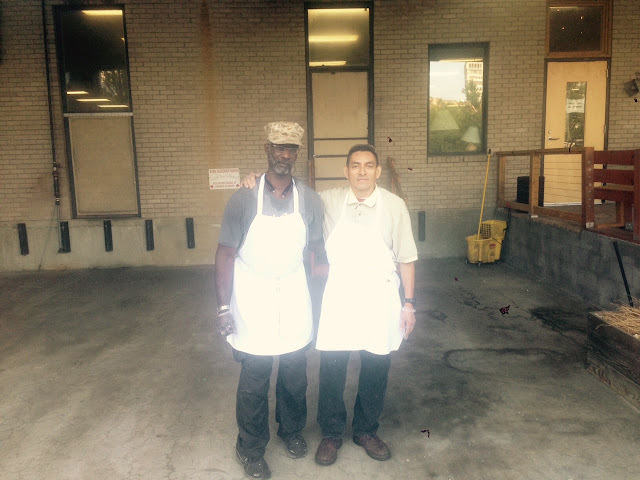 John and Herbert (pronounced ERR-ber) make up our distinguished two-man cleaning crew team at the Bakery. Every employee does some cleaning, but ultimately, John and Herbert are responsible for making sure our 4,000 sq ft facility is as clean as your mom's kitchen floor. John is a NC native, and a disabled ex-Marine. He has been with the Bakery since 2010. Hebert, a native of Peru, has been with the Bakery since early 2015. Initially, I was unsure how these two teammates would work together, but have been amazed at how they have overcome language and cultural barriers to be great working partners, helping each other out and strategizing on the many dirty and difficult jobs the Bakery can hold, and even becoming friends along the way.